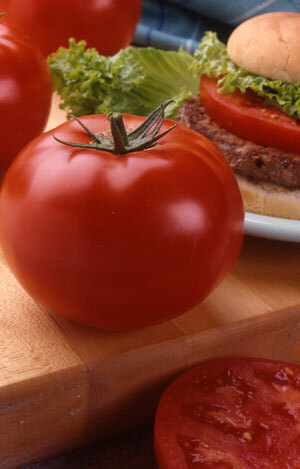 The Big Beef tomato is an almost foolproof variety because it was bred for disease resistance in addition to taste. Growing award winnning varieities always improves your chances for success, and the Big Beef hybrid tomato was the winner of the 1994 All America Selections award. These tomatoes can grow quite large to one pound in size. The flavor is good old-fashioned tomatoey flavor and the plants are high yielding. The vines are indeterminate so staking or caging is recommended. Big beef hybrid tomatoes are vigorous and easy to grow from seedlings or to grow from seed indoors and then planted outdoors when the soil warms up. Guidance on safe planting dates can be found in When to Plant Tomatoes.